Demanding their professional recognition, advocate clerks yesterday threatened to go on an indefinite hunger strike if the Advocate Clerk Council Bill is not passed by February 6, reports UNB. 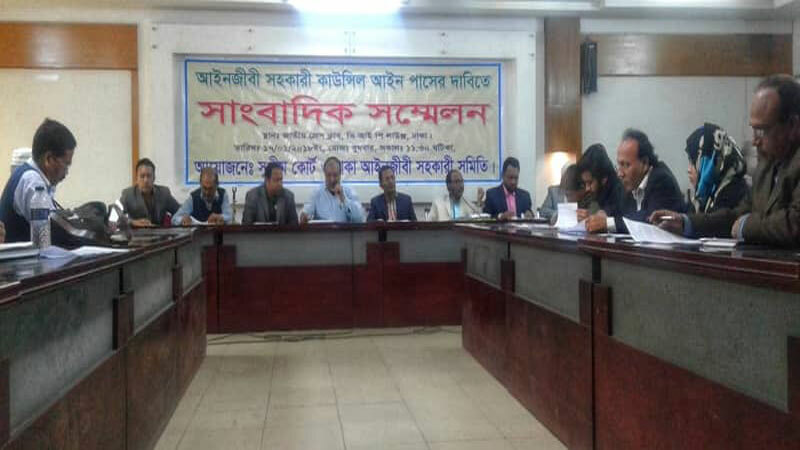 Anwar Hossain, president of the Supreme Court Advocate Clerks’ Association came up with the ultimatum at a press conference jointly organized with the Advocate Clerk Association (BACA) at the Jatiya Press Club. The president of the association also sought Prime Minister Sheikh Hasina’s intervention to have the law in place, which they had been demanding for 31 years. “Since 1986, Bangladesh Advocates’ Clerks Association (BACA) has been demanding that an independent be put in place for their professional recognition,” he said. Anwar Hossain claimed that despite giving assurances by the Prime Minister and Law Minister, the law is yet to be formulated for unknown reasons. Many countries, including West Bengal in India, have such laws to protect the interest of this profession, said Md Anwar Hossain. “If the Advocate Clerks Council Bill is not passed by February 6, we’ll go on a hunger strike from February 7 in front of the Jatiya Press Club and it’ll continue until it is proposed by parliament,” he added. President of Dhaka Advocate Clerks’ Association MA Razzak, its general secretary Md Emdadul Haque, general secretary of Supreme Court Advocate Clerks Association Md Zahidul Islam were also present at the press briefing.